Waynapicchu is the famous spire-like mountain behind the site of the Machu Picchu ruins. It is not the only mountain to climb in the area, but it is the most recognizable. It is the peak located behind the cover photo on Part 3, and has also been in nearly every famous photo taken from the monument. For a long time, I wasn’t sure if I was going to try this climb. The hike is about 1000 feet of elevation gain (which isn’t too bad), but it’s famous for being very difficult, for reasons which will become clear as you continue reading. Still, the hike was supposed to be spectacular (listed the number one attraction of the Machu Picchu area on TripAdvisor, among other things). There was also a big part of me that wanted to see if I could do it, a challenge to myself. Odds are that it will be many years until I return to Machu Picchu (if ever), and if I didn’t at least try to make it up the mountain, I’d regret it for a long time. As a result, I bought an advance ticket for the mountain despite the indecision. If worst came to worse, I could turn around and not finish, but once I made up my mind that I was going, I wasn’t going to let much stop me. When buying the ticket, prospective hikers can pick one of two time slots. I picked the early time (allowed in at 7AM), both because I needed to return to Cusco that night and because it would keep the temperature down during the ascent. The staggered ascent times are important, as are the limited quantity of people in each slot (about 200) because the trail is quite narrow and the viewpoint at the summit is tiny. Here is the line to get onto the trail. The guard house makes hikers sign in and out to monitor traffic flow throughout the day. Early on in the trail, there’s a split, showing the magnitude of the challenges ahead. 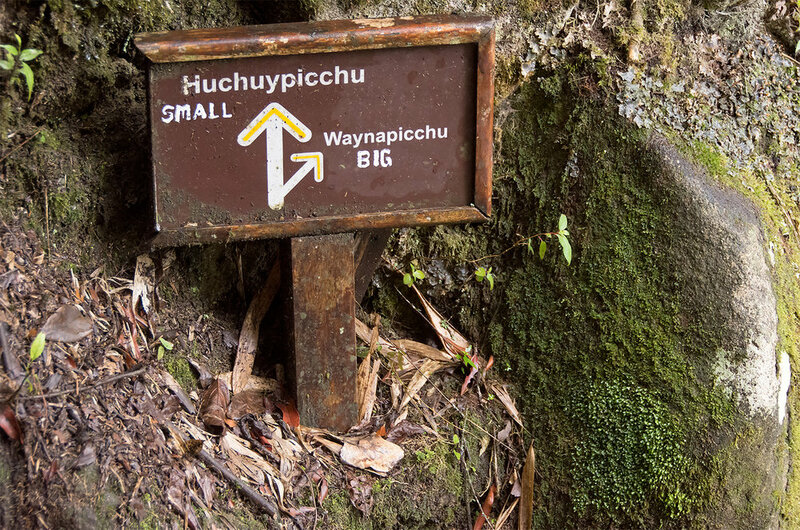 It also shows that nobody can decide how to spell Waynapicchu. Looking up at the task at hand, partially shrouded in fog. At this point I was worried about the state of the view at the top, but the fog also kept the temperature in a manageable state. And this is the part that I was dreading. The hike up Waynapicchu is 99% stairs. It tests the most fit persons’ stamina (and knees). In some places the stair pitch was also extremely high, which made the climbing process even more difficult. The wires, when available, were definitely useful for keeping balance. My policy was generally to keep things slow and take plenty of breaks, though even with all of the short pauses the going was extremely difficult at times. I was wearing a heart rate band, and at time my pulse matched what would normally be found in a sprint. It was intense. About 3/4 of the way up, the trail gets even more steep and splits into a small loop, because the trail is too narrow for hikers to pass each other. The terraces also serve as a good place for hikers to take a rest and take pictures without blocking the flow of traffic. 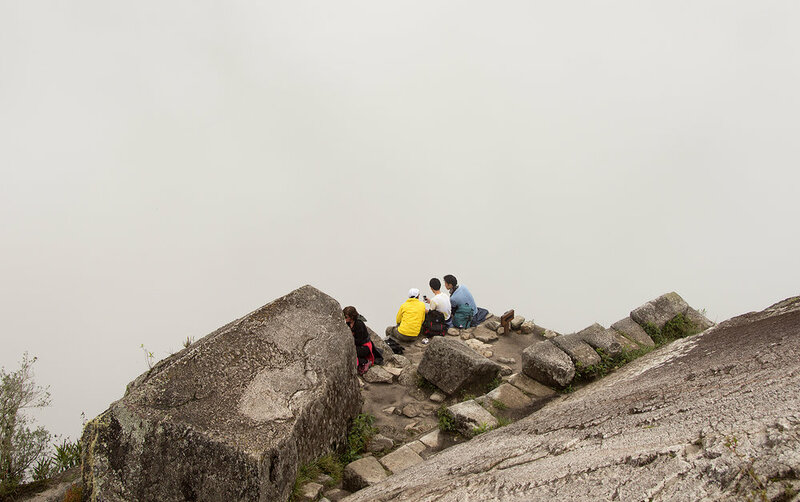 Near the summit, a group of friends enjoy the shrouded view. I did it! This sign is slightly down from the very crowded peak (which was not actually all that photogenic), but I conquered the mountain. The best views on the hike happened at the beginning of the descent. 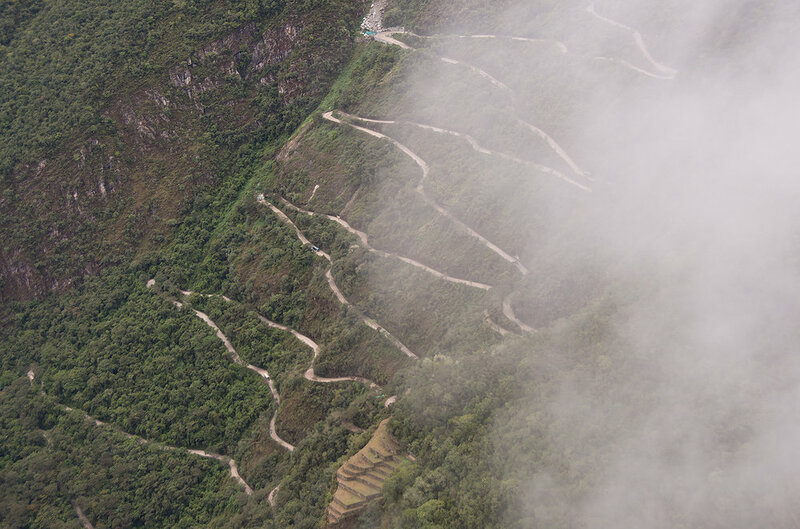 First, here is the road that the buses take to get up to the monument from Aguas Calientes. As an aside, that road is pretty scary. It’s dirt, bumpy, has big drops off the side, and the buses drive too quickly. The one that took me up on the first day at the park also had a suspension problem, which added more fear into the drive. Tourists don’t need to take the bus up to the monument if they don’t want to, but that hike (which I didn’t dare attempt) makes the Waynapicchu hike look like child’s play. This is the view people do this hike for. Almost the entirety of the Machu Picchu ruins are visible, and it gives you an amazing sense of the scale of the whole thing. The fog lifting through the valley, creating ever-changing variations on this view, made it even better. This is when it clicked: this hike was well worth it. This is a view that’s now burned into my brain. It can’t be forgotten. The work required to get it makes it even more permanent. Near the summit, there are more ruins to explore. The high priest lived up here, looking down upon the rest of the city (when it wasn’t foggy, of course). The Temple of the Moon is also available to see on this hike, but it adds another loop and I wasn’t able to make it there. This view also shows that the Rio Vilcanota was visible at times, almost 3000 feet below. The scale of this view was so difficult to capture. It’s funny that the best picture I had demonstrating that scale was also one of the foggiest. Going down. 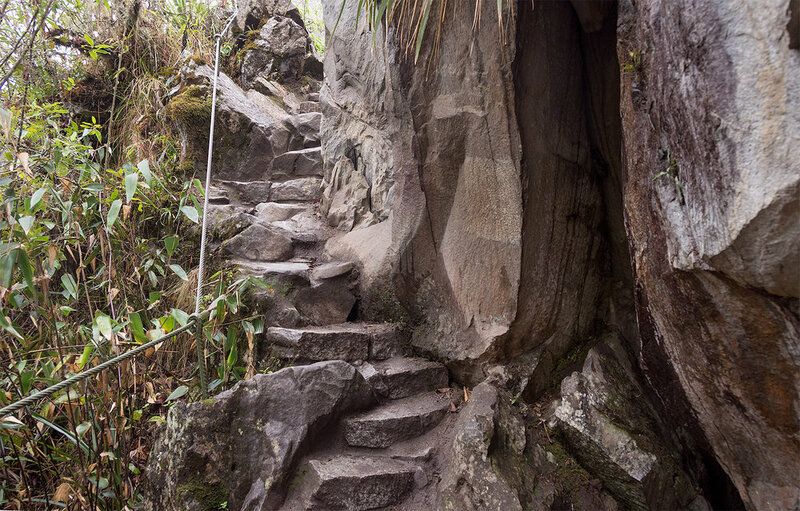 In a lot of ways, the descent off of Waynapicchu was trickier than the ascent. First of all, the steepness going up fights you on the way down. In the first picture, you can see people bracing themselves against the back of the stairs, and it was absolutely necessary in spots (along with going down sideways in spots). The fog, which kept things cool and picturesque earlier, was starting to deposit mist onto the rocks, making the trip down slippery and treacherous. It took an hour and fifteen minutes to climb Waynapicchu; it took one hour and thirty minutes to get back down. A bit before 11:00, I was off the mountain. The sky was clearing, so it was easy to look back and see what I had just accomplished. Given how well I had done on the previous day, I didn’t have many aspirations for photos in the now-crowded monument on the way back to the bus and scary road. I did manage to grab a couple of photos that I liked in the brief stroll to the entrance, though, including more chinchillas. Back at the park entrance, it was time to celebrate! No matter that it was still 11:00, I had just climbed a mountain. I also liked that the beer had a picture of the mountain I just climbed on the bottle. As far as mass-produced lagers go, Cusqueña is one of the better ones. It really hit the spot as I looked through some of the pictures that I took on the walk, thinking about the previous few days. With my work in Machu Picchu done, it was time to return to Cusco. This meant descending back to Aguas Calientes, where I had lunch, a pisco sour or two, and a nap. I got a few parting shots of the strange train city before catching a train of my own. Thus ends the Machu Picchu portion of this journey, as well as the solo/non-driving portion. After arriving back in Cusco, it was straight back to the hotel. My friend Jake was driving there from La Paz with our rental car, and the following morning we would embark on an incredible two week road trip. One of the main highlights of the trip was over, but the adventure was just beginning.